OpenSSH uses public keys to authenticate hosts. One machine attempts to access another machine and presents its key pair. The first time the host authenticates, the administrator on the target machine has to approve the request manually. The machine then stores the host's public key in a known_hosts file. Any time that the remote machine attempts to access the target machine again, the target machine simply checks its known_hosts file and then grants access automatically to approved hosts. The known_hosts file stores host entries in a triplet of the host IP address, host name, and key. This file can rapidly become out of date if the IP address changes (which is common in virtual environments and data centers) or if the key is updated. SSH keys have to be distributed manually and separately to all machines in an environment. Administrators have to approve host keys to add them to the configuration, but it is difficult to verify either the host or key issuer properly, which can create security problems. On Red Hat Enterprise Linux, the System Security Services Daemon (SSSD) can be configured to cache and retrieve host SSH keys so that applications and services only have to look in one location for host keys. Because SSSD can use Identity Management as one of its identity information providers, Identity Management provides a universal and centralized repository of keys. Administrators do not need to worry about distributing, updating, or verifying host SSH keys. When keys are uploaded to the IdM entry, the key format can be either an OpenSSH-style key or a raw RFC 4253-style blob. Any RFC 4253-style key is automatically converted into an OpenSSH-style key before it is imported and saved into the IdM LDAP server. The key type can be determined automatically from the content of the public key, and the comment is optional, to make identifying individual keys easier. The only required element is the public key blob itself. The ipa-client-install script, by default, configures an OpenSSH server and client on the IdM client machine. It also configures SSSD to perform host and user key caching. Essentially, simply configuring the client does all of the configuration necessary for the host to use SSSD, OpenSSH, and Identity Management for key caching and retrieval. If the SSH service is enabled with the client installation (which is the default), then an RSA key is created when the ssh service is first started. When the machine is added as an IdM client using ipa-client-install, the client is created with two SSH keys, RSA and DSS. There is an additional client configuration option, --ssh-trust-dns, which can be run with ipa-client-install and automatically configures OpenSSH to trust the IdM DNS records, where the key fingerprints are stored. Alternatively, it is possible to disable OpenSSH at the time the client is installed, using the --no-sshd option. This prevents the install script from configuring the OpenSSH server. Another option, --no-dns-sshfp, prevents the host from creating DNS SSHFP records with its own DNS entries. This can be used with or without the --no-sshd option. If necessary, generate a host key. When using the OpenSSH tools, make sure to use a blank passphrase and to save the key to a different location than the user's ~/.ssh/ directory, so it will not overwrite any existing keys. Click the name of the host to edit. 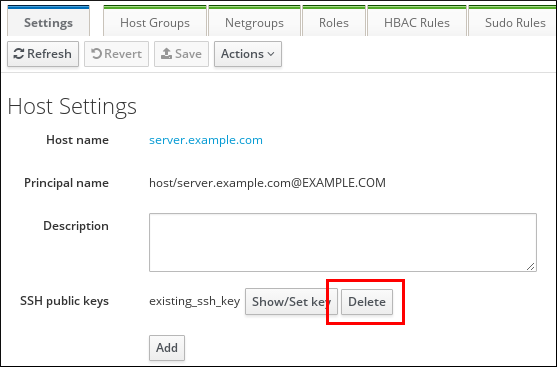 In the Host Settings area of the Settings tab, click Add next to SSH public keys. Paste in the public key for the host, and click Set. The SSH public keys area now shows the new key. Clicking Show/Set key opens the submitted key. To upload multiple keys, click the Add link below the list of public keys, and upload the other keys. When all the keys have been submitted, click Save at the top of the host's page to save the changes. When the public key is saved, the entry is displayed as the key fingerprint, the comment (if one was included), and the key type. After uploading the host keys, configure SSSD to use Identity Management as one of its identity domains and set up OpenSSH to use the SSSD tooling for managing host keys. This is covered in the "Configuring Services: OpenSSH and Cached Keys" in the System-Level Authentication Guide. 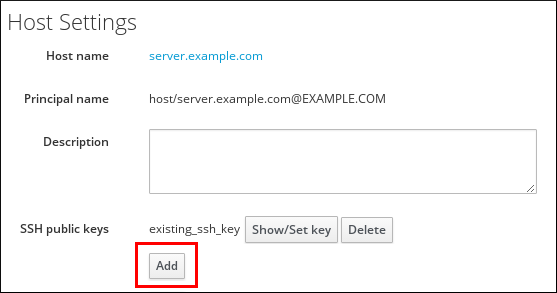 Host SSH keys are added to host entries in IdM, either when the host is created using host-add or by modifying the entry later. RSA and DSS host keys are created by the ipa-client-install command, unless the SSH service is explicitly disabled in the installation script. 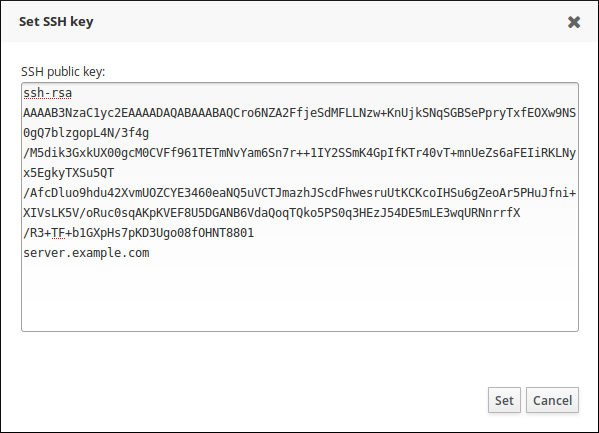 Run the host-mod command with the --sshpubkey option to upload the base64-encoded public key to the host entry. Adding a host key also changes the DNS SSHFP entry for the host, so also use the --updatedns option to update the host's DNS entry. A real key also usually ends with an equal sign (=) but is longer. A host can have multiple public keys. Host keys can be removed once they expire or are no longer valid. In the SSH public keys area, click Delete by the fingerprint of the key to remove it. Click Save at the top of the host's page to save the changes. The key type is determined automatically from the key itself, if it is not included in the uploaded key.